Jackrabbit can keep track of the dates you define as closed and be aware that attendance does not need to be taken in the Staff Portal on those dates. When a closed date, or date range, is entered attendance cannot be added on those dates in the Staff Portal. 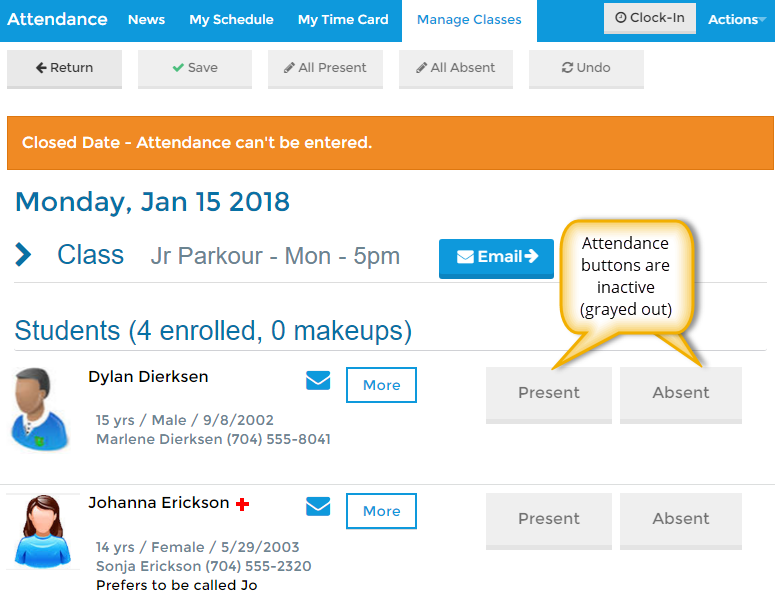 The Incomplete Portal Attendance alert on the Executive Dashboard and the Incomplete Portal Attendance report will both omit any dates defined as a closed date. Create closed dates from the Tools menu > Edit Settings. Select Closed Dates. Use the Add Closed Date(s) button to add the dates of your closures. You can add as may dates as needed. To save a single date, enter the same date in the Start Date and the End Date fields. Staff Portal attendance cannot be taken for a closed date. On a closed date students will be listed in the Staff Portal but the attendance buttons will be inactive. A User's ability to add a closed date is controlled by the User ID permission Closed Dates located in the Tools section. Edit User ID permissions from Tools > Edit Settings > User IDs.